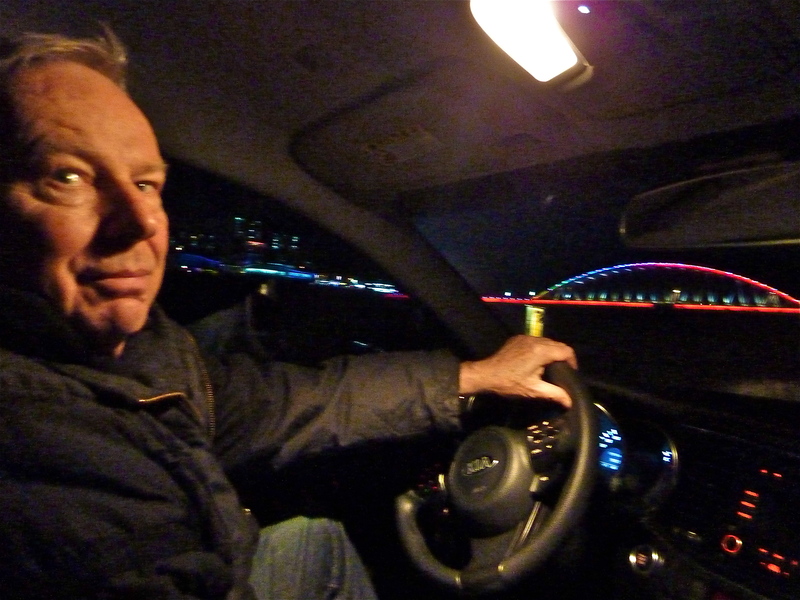 The trip through the countryside of South Korea continued to provide a cornucopia of splendid vistas, historic sites and constant reminders of how vibrant and varied is the Korean life-style. 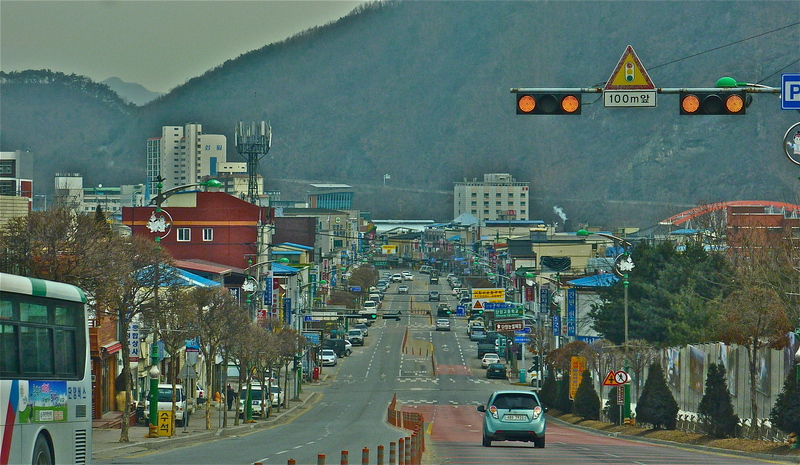 A not unusual circumstance in the Korean peninsula, Danyang City is surrounded by high mountains; it is a celebrated centre of hang-gliding, deep, limestone caves and a varied choice of interesting, enjoyable excursions within an hour’s drive, fine accommodations, hot springs and fine cuisine as I came to expect wherever we stopped for a visit. Oh, and the local farmers produce a prized garlic, a healthy flavourful addition much used in the nation’s dishes. How good is the pungent bulb? So proud are the locals they celebrate by choosing a Garlic Princess in a beauty contest. Pretty yes, but is she kissable? 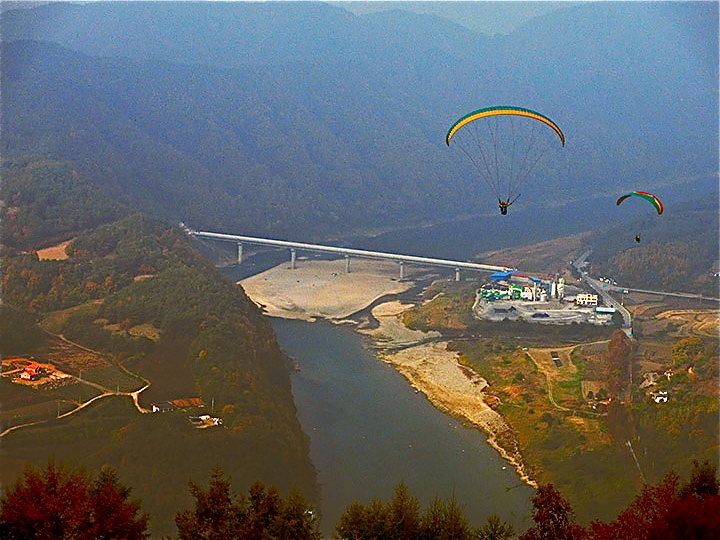 The resort town built around the looping elbow of the Nam Han River is rather small by Korean standards with something less than 40000 inhabitants. 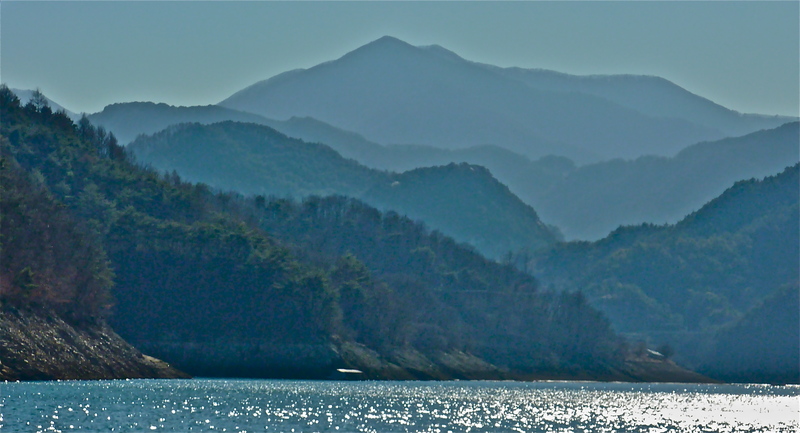 Boasting ‘Eight Scenic Beauties’ as an alluring tourist destination, it is an unhurried three hours drive south of Seoul where to recharge one’s emotional and physical batteries. A couple kilometres out from the town proper a comfortable hotel provided all the amenities one could wish for after several days of heavy duty travel. Called the ‘Edelweiss’ it was a little surprising but I didn’t discovr if there were any such European Alpine flowers in the surrounding mountains. On the other hand, why not? 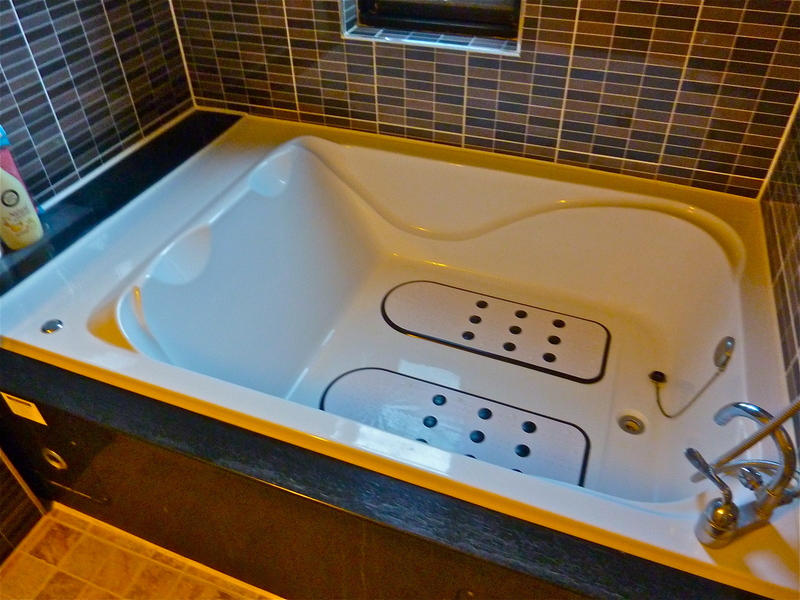 In the course of my working career coupled with my passion for travel I’ve necessarily sojourned in countless hotels but this side-by-side bathtub for two was a definite first. 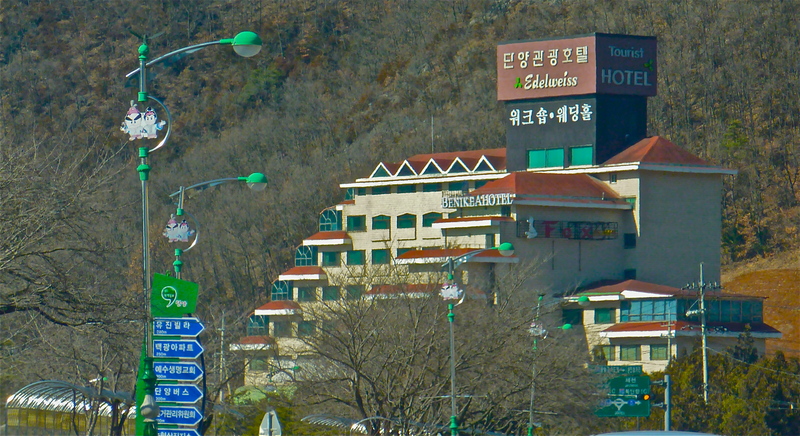 Korean accommodations as far as I experienced always placed a premium on bathroom facilities. Loved it! I’m thinking the ‘Art of Fine Eating’ should be classed as the national sport of Korea. Seriously, for what by usual Canadian standards is a fast food price one can invariably sit down to a copious dinner with all the appetizers, condiments, salads and soups one can desire. Just bring an appetite and enjoy! 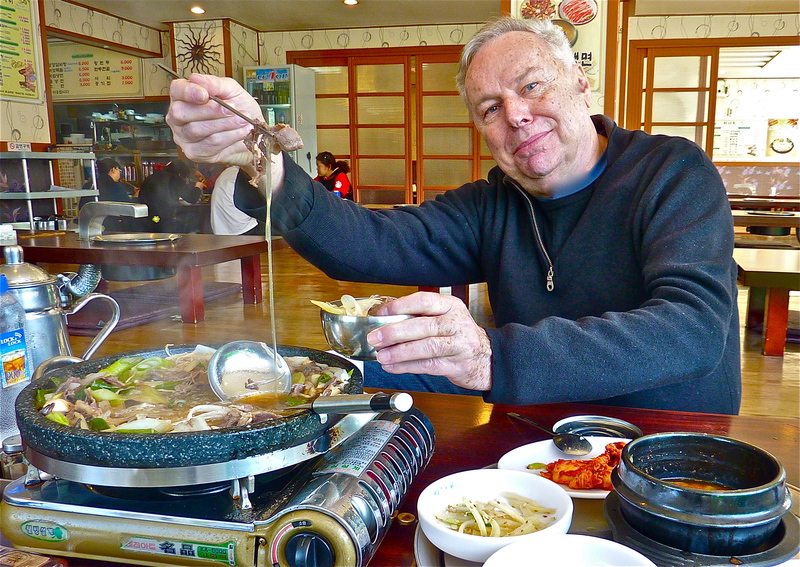 Notice what is a common amenity in a Korean restaurant – a table top gas range to cook your food as you go. The advantages are you can choose how well done or rare you want your meat, how crispy your veggies, as well as keeping the savoury broth warm at all time. 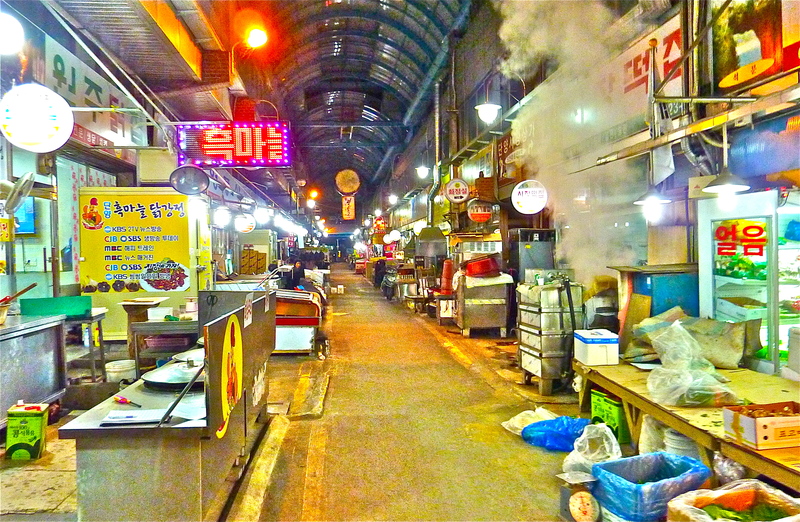 The covered market place off the main street is an emporium for all types of useful shopping and restaurants. In a mountainous country that features a plentiful winter snowfall it’s a much appreciated amenity by the townsfolk. The train bridge and highway viaduct as seen from the hotel room. 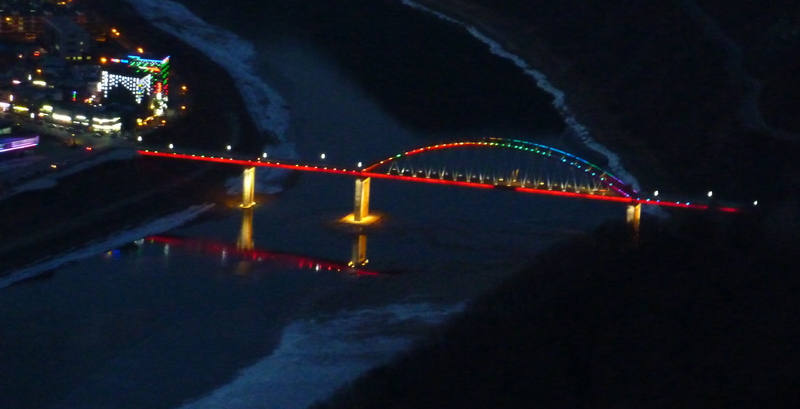 Thiz attractive pedestrian bridge crosses the Nam Han River to a park beyond; it is imaginatively illuminated at night and provides a conducive aura for strolling lovers seeking a bit of magic. 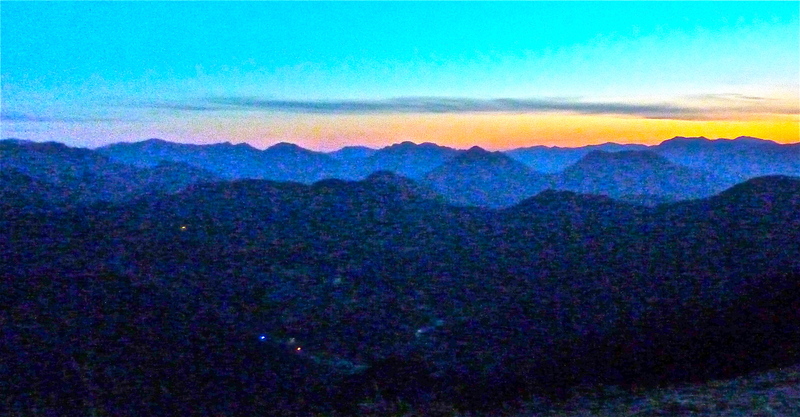 A drive up the facing mountain in retrospect shouldn’t have been undertaken but the prospect of a night view of the panorama below was too much to resist. The rough, narrow roadway up to the jump off area for expert hang-gliders was deeply rutted and at times iced up making driving a hazardous undertaking. Barely more than a single lane wide I was grateful not to encounter another car coming the other way; the precipitous cliff on the right hand side had absolutely no guardrail and it was a sheer drop off several hundred metres down. OY! I really should have known better and turned tail but on the other hand the view was indeed magnificent and soon I only had to worry about navigating safely back to town. The return trip over the bridge and yes, we had a celebratory drink back at the hotel, me with a sheepish smile and Ara with obvious relief. “Yeah, sure there was nothing to it!” Said he with a reassuring smile. 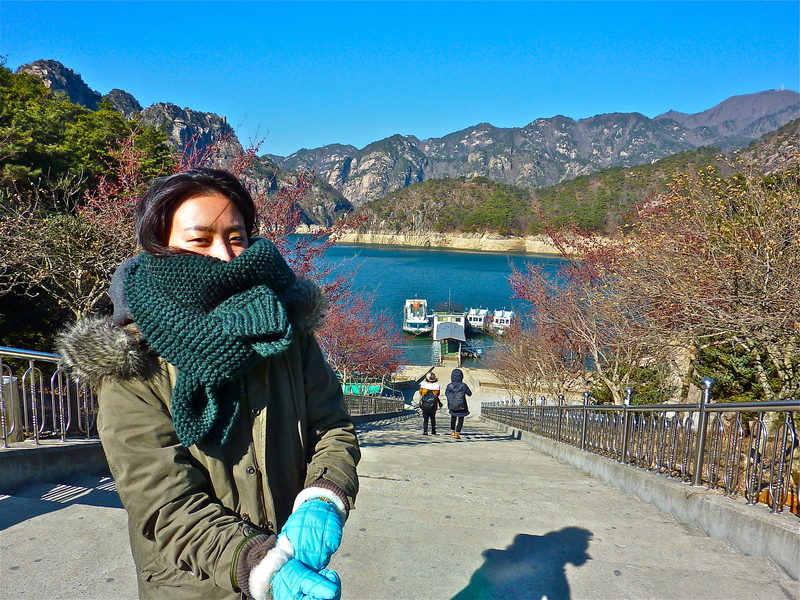 At the top of the ferry dock at Chunguiko about to take a boat cruise along the Namhangang River – my companion is well prepared to face what was to be one cold outing. 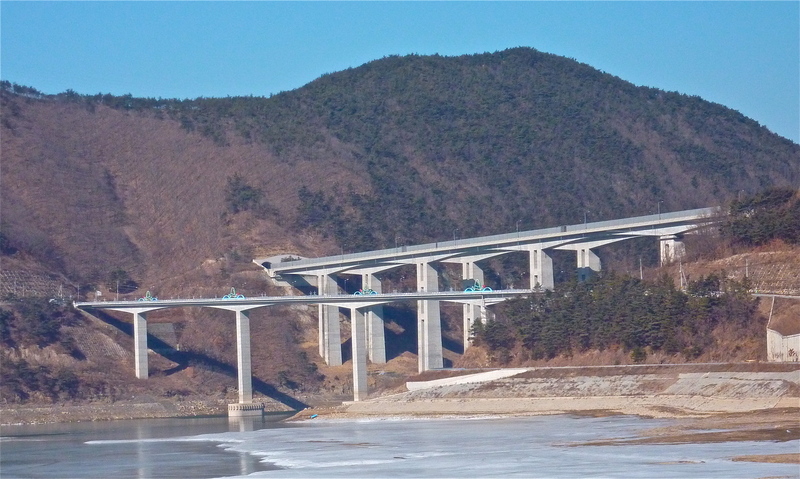 The river was dammed in 1986 to create a vast artificial lake to provide a secure water supply for Seoul as well as additional hydro-electric power. 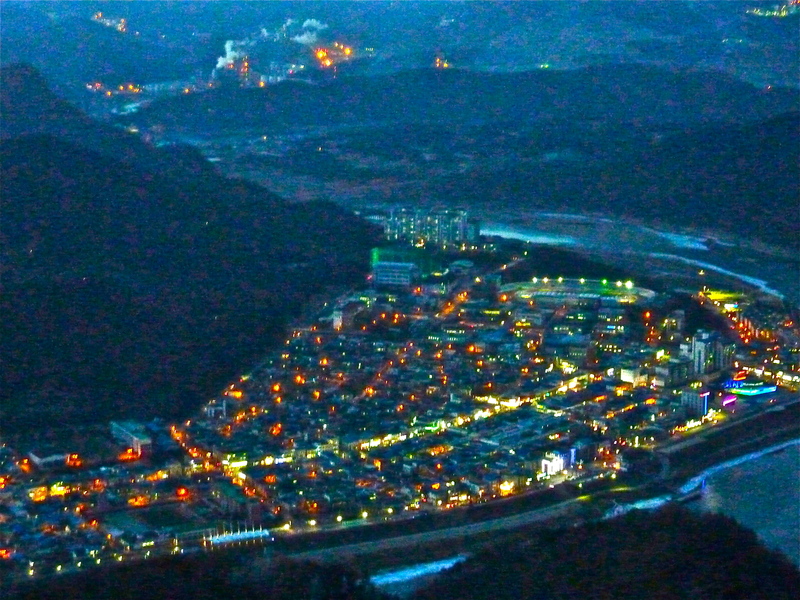 Ancient parts of Danyang City dating back many centuries unfortunately was sacrificed to the demands of the present. The area is dotted with deep caves, surrounded by three national parks. 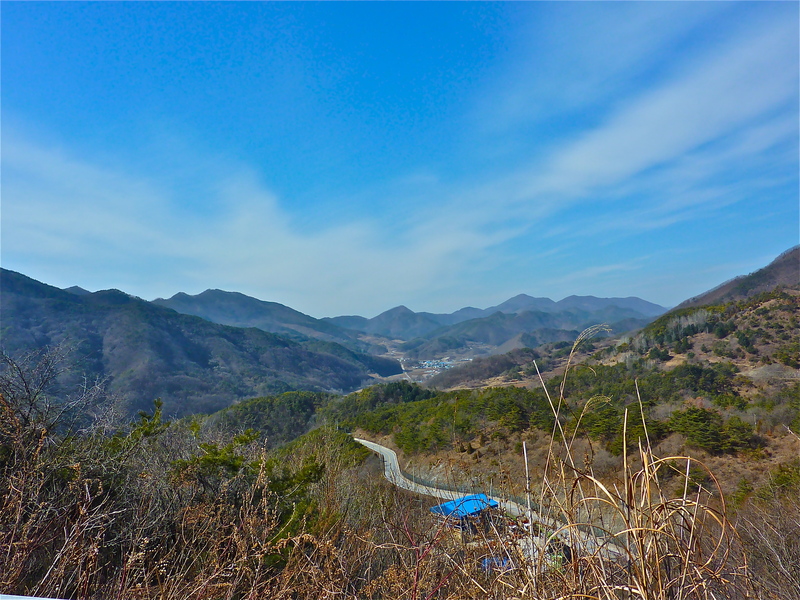 A classic Korean peninsula vista that features wooded hills backed by higher mountains forming an impressive panorama. 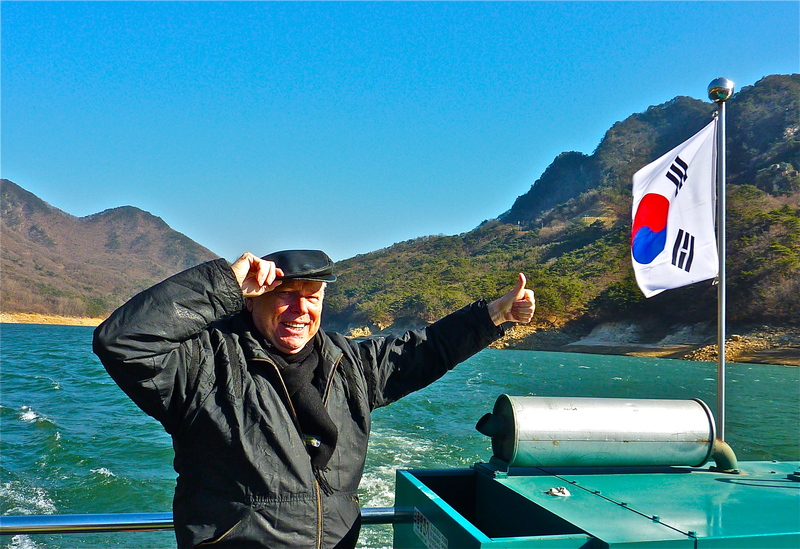 I was a little less well bundled up for the excursion but couldn’t resist saluting the national flag (known as Taegukgi) of my host country. 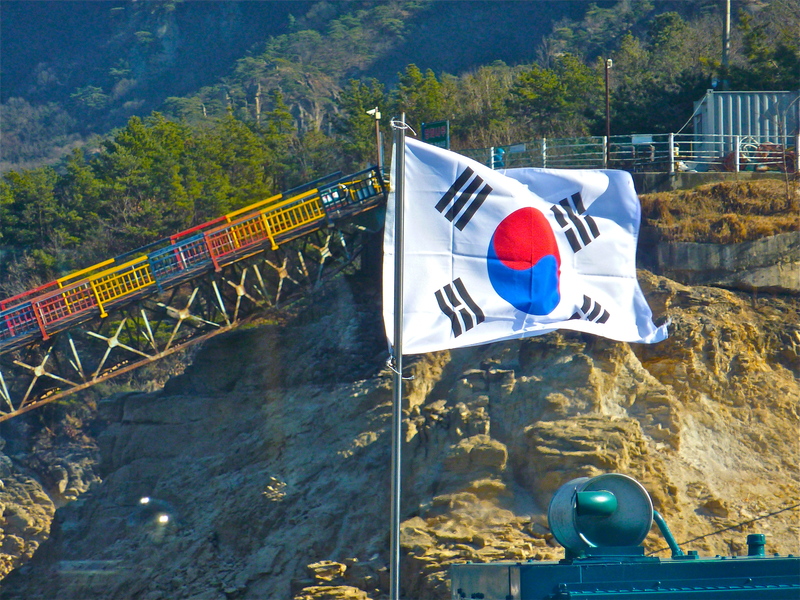 The flag’s design is entirely unique, composed of three parts; a white background, a red and blue ‘Taeguk’ and four black trigrams. The white represents peace and purity, the Taeguk is the yin and yang symbol that represents the balance of the universe (the blue represents negative cosmic forces whereas the red opposite positive forces) finally the trigrams together represent the principle of movement and harmony. Each corner trigram (hangul: kwae) represents one of the four classical elements sky, sun, moon and earth. There’s much more to the flag and it’s worth doing a little research into its history and discover more of how it came to be. For a country with such a long and illustrious history it wasn’t until 1883 when the Joseon government officially promulgated Taegukgi to henceforth be used as the official national flag. As a boy I thought the French ‘bleu, blanc, rouge’ was rife with meaning but it pales compared to the beautifully designed and poetic Taegukgi. The national ethos of ‘The Land of the Morning Calm’ in many respects is underscored by its proud ensign. 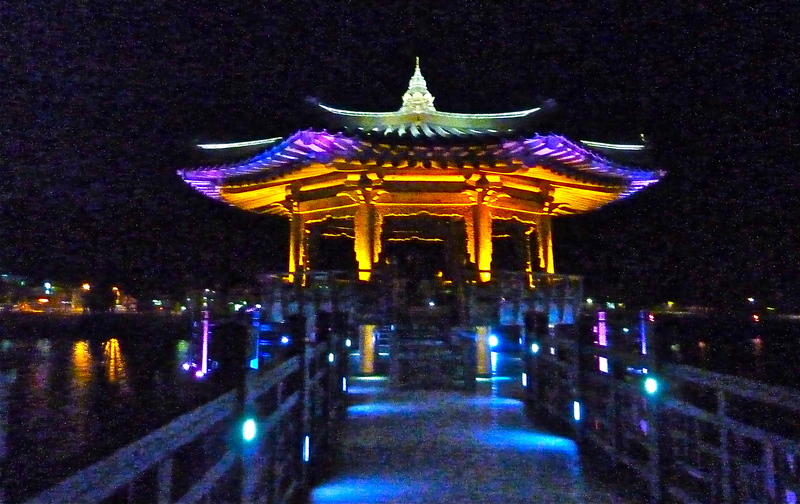 A good time to exit here and hope you check out my next entry, ‘Guin-sa’ a spectacular Buddhist temple complex that will surely impress you as it did me.